Let me come to the topic now. Balloons!!! this stuff keeps me joyous always, whenever i have a glance at them. Even a tiny one makes a HUGE smile in my face. 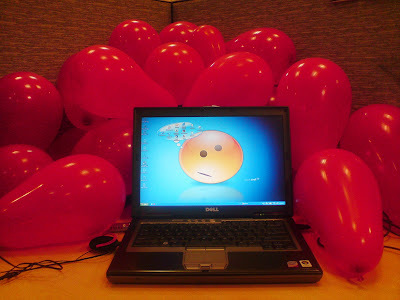 and imagine, if there are plenty, i mean Plenty, of BIG balloons in cubicle. Wow!!!!!!! that too, of your fav colour, ReD. Ya.. this was the theme for decorating Pradeep's Cubicle, on his B'day. Full of Balloons, red ones, big ones, always luks like its about to fall on you... So, me and Venkata (special thanks to him) initially started with small balloons, which does not look nice at all. We went for Balloon Shopping in nearby store, and got BIG ReD Balloons. Though Venkata got a Hand-Balloon-Blowing-Pump, I didnt want to use that to blow up these Balloons, as i luv blowing it myself. Since Venkata didnt have his dinner, he went for having dinner after this lil Balloon shopping. In the meanwhile, just blew around 30 balloons, in about 40 mins (my personal record. Don't remember the previous record though :) ). 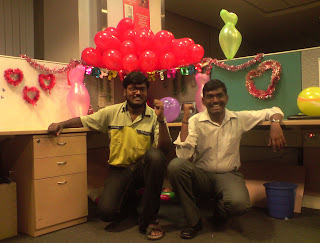 Then it tuk little while for we two decorating Pradeep's Cubicle, with blasting up around 10 balloons in the process. The security in my floor had tough time standing-up and sitting-down, everytime a balloon blasts. so, All went well, and its done done from our side.